Humor to convey a deeper social meaning. 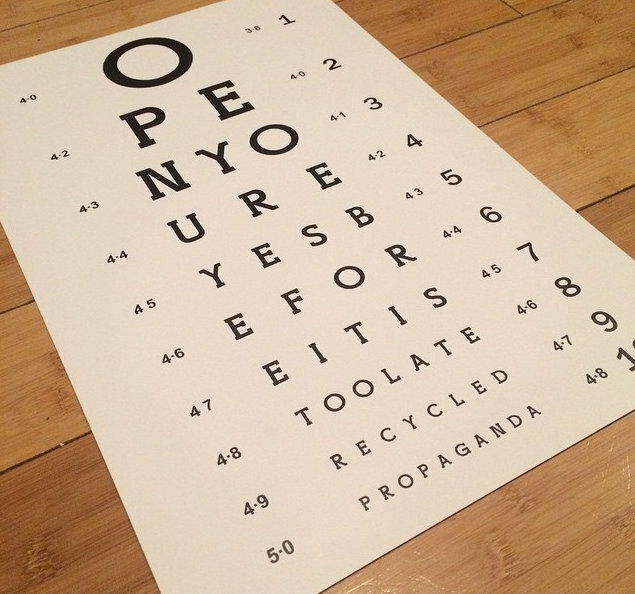 Recycled Propaganda is a design and art movement that is driven by the urge to encourage critical thought and debate in an increasingly apathetic and desensitized society. In short, its mission is to promote thought, initiate conversation and inspire change. These founding concepts are undertaken by utilizing the power of the visual. If a picture says 1,000 words, its potency for change is surely 1,000 times stronger. The power of the visual is not just compelling but can also be highly ambiguous, thus promoting self-directed and critical thought. This brings us to the fundamental nature and meaning of Recycled Propaganda. To recycle the black and white – fear and fact based picture that we are so frequently plagued with, into a more colorful, complex and equivocal one that is open to interpretation, more accurately reflects our reality. Life is confusing, complex and uncertain, to reduce these nuances to the lowest denominator is to reject our humanity and dilute our beauty. 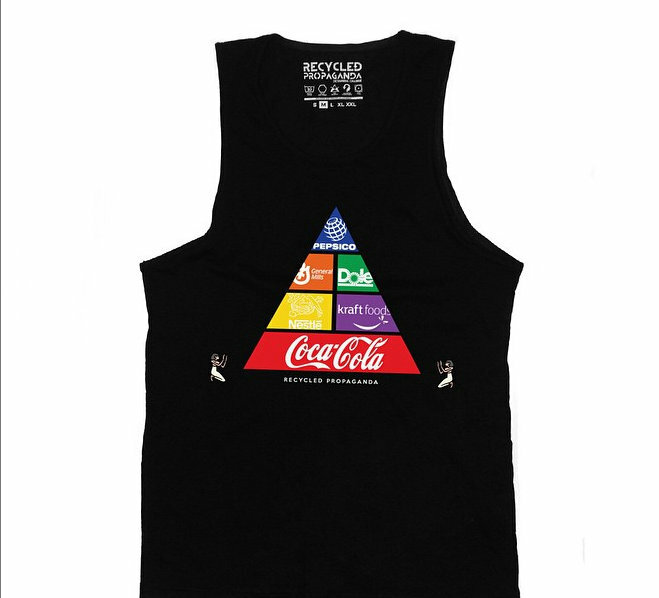 Food Pyramid not to be confused with mine. Founded in 2013, Recycled Propaganda is the brain-child of Izaac Baron Zevalking, who remains the sole creative, although he is supported by an ever expanding team. Zevalking is an artist whose work addresses complex problems and issues in global history and current affairs. Originally from the UK, his artwork serves as a springboard for confronting and discussing issues that face humanity. The images are conveyed through digital design, prints, stickers, t-shirts, works on canvas, and murals, and provide a vivid, authentic commentary on society and culture. His brand of social-art, although relatively new to the scene, has created a buzz in the Las Vegas area as well as further afield. This year alone, Recycled Propaganda has been featured in the Las Vegas Sun and The Desert Companion and has successfully shown in Denver and London and had its first solo show at The Amanda Harris Gallery of Contemporary art. The future is definitely bright for this up-and-coming artist and visionary; watch this space. Part of The MMpiHer Method™ (the second month of the three month program) is MMpiHer Marketing™ (the part every body loves to focus on) which introduces the concept of CAKE™ or a layered approach to marketing. When advising clients in the early stages of business development I suggest starting a Pinterest Board to help curate images. This helps give designers (logo/website) an idea of your company’s style as a means of achieving a really comprehensive and cohesive look that translates your content visually throughout all mediums. Recycled Propaganda incorporates very important elements I often stress to clients, when possible the use of humor (or a unique image) to convey a deeper meaning will draw a reader/potential client in but content and the quality of the work is what builds a lasting business relationship which should be the goal of any ethical business. Disclosure: I do not know, have not worked with or been paid by Recycled Propaganda. Whether you’re an established business or a startup and would like some ideas for marketing please follow me on Pinterest (Month 1, Month 2 & Month 3) or Instagram. If your ethical company or an ethical company you support would like to be considered for feature in a future post please send a short bio and link to the company website to my email Melayna Lokosky at gmail.com. Fascinating. 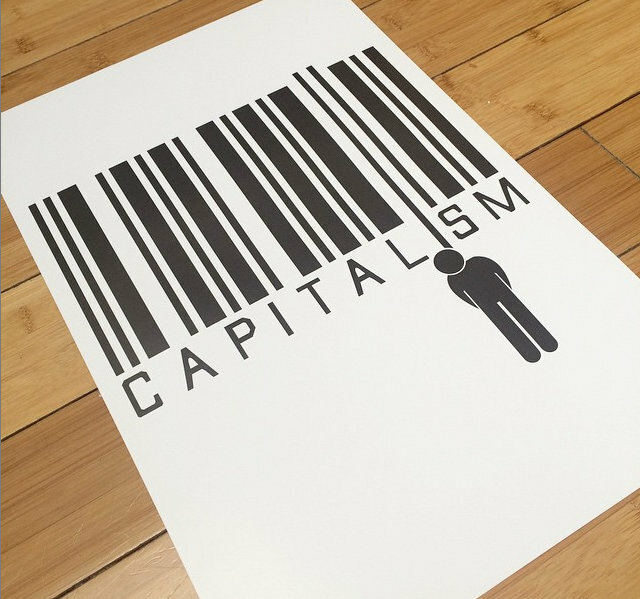 Don’t necessarily agree with the bar code with the person hanging from it but it is very thought provoking. And the baby in the womb with the tablet is such an incredible statement on our culture. Will check out your info on Pinterest. I did not understand the purpose of it until now. Nice stuff! !